عباسپور, اکرم, عبدیان رکنی, محمدرضا. (1395). بررسی خصوصیات پرش هیدرولیکی در حوضچه آرامش واگرا با بستر زبر مکعب مستطیلی. نشریه آبیاری و زهکشی ایران, 10(5), 636-648. اکرم عباسپور; محمدرضا عبدیان رکنی. "بررسی خصوصیات پرش هیدرولیکی در حوضچه آرامش واگرا با بستر زبر مکعب مستطیلی". 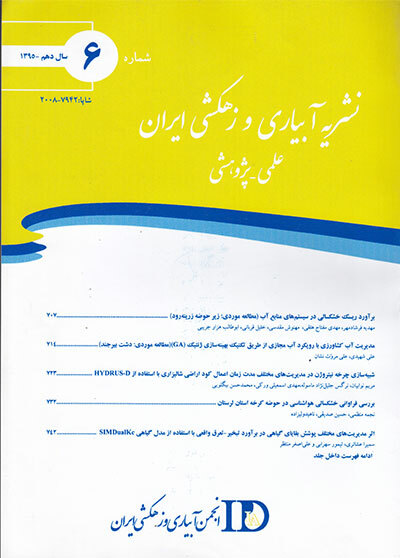 نشریه آبیاری و زهکشی ایران, 10, 5, 1395, 636-648. عباسپور, اکرم, عبدیان رکنی, محمدرضا. (1395). 'بررسی خصوصیات پرش هیدرولیکی در حوضچه آرامش واگرا با بستر زبر مکعب مستطیلی', نشریه آبیاری و زهکشی ایران, 10(5), pp. 636-648. عباسپور, اکرم, عبدیان رکنی, محمدرضا. بررسی خصوصیات پرش هیدرولیکی در حوضچه آرامش واگرا با بستر زبر مکعب مستطیلی. نشریه آبیاری و زهکشی ایران, 1395; 10(5): 636-648. Hydraulic jump is the most important phenomenon in the rapid variable flow is of interest to hydraulic engineers. It has been used for dissipation of kinetic energy downstream of hydraulic structures such as spillways, chutes and gates to protect stilling basin. This study the roughness of the bed and the divergence of basin have studied simultaneously. The experiments have done with the walls diverging angles of 0, 2, 4, 6 and 8 degrees for six different Froude numbers. In total, 190 tests were performed in the range of 5 to 8 Froude numbers. The relative depth reduction of jump in the angles of 0, 2, 4, 6 and 8 degrees have obtained 10, 17.2, 22, 25 and 25.5% respectively. The average reduction of length jump, T, for the angles of 0, 2, 4, 6 and 8 degrees with the rough bed have obtained 45.5, 55, 56.1, 64 and 66.2% respectively. The man reduction of length jump for the cube bars is 60.3%. The loss of energy in the jump EL is equal to the difference between the specific energy before and after the jump, E2 - E1. The relative energy loss, EL/E1, for the angles of 0, 2, 4, 6 and 8 degrees have obtained 58.5, 62.4, 64.1, 65.9 and 67% respectively. In this study, the effect of the square ribs bed on hydraulic jumps was investigated. The divergence of basin without roughness effect also has influenced on reducing the relative length of jump about 37 to 47% and the relative length of jump is proportional to the angle of divergence basin. The results show that both the divergence angle of stilling basin wall and bed roughness of bed have reduced the length and depth of hydraulic jump. This makes it more economical to build a basin and control of jump is better. اسمعیلی ورکی،م.، صاحبی،ف.، نوابیان،م و امیری،ز. 1393. نشریه پژوهش­های حفاظت آب­و­خاک، دانشگاه علوم کشاورزی گرگان. 21 .5: 70-49 . Abbaspour, A., Hosseinzadeh Dalir, A., Farsadizadeh,D and Sadraddini,A.A. 2009. Effect of sinusoidal corrugated bed on hydraulic jump characteristics, Journal of Hydro-environment Research. 3: 109-117. Ead, S.A., Rajaratnam, N. 2002. Hydraulic jump on corrugated bed, Journal of Hydraulic Engineering, ASCE 128.7: 656-663. Gohari, A and Farhoudi, J. 2009. The charactristics of hydraulic jump on rough bed stilling basins, 33rd IAHR Congress, 9 Agust. Advances in the Fundamentals of Water Science and Engineering, Vancouver. Gord Noshahri, A., Omid, M.H and Kochakzadeh, S. 2009. Experimental study of hydraulic jump characteristics with sharp abutment in a expanding stilling basin, Journal of water Research. 3.4:3-31. Hager, W.H and Bremen, R. 1989. Classical hydraulic jump; sequent depths, Journal of Hydraulic Research. 27.5: 565–585. Hughes, W.C and Flack, J.E. 1984. Hydraulic jump properties over rough bed, Journal Hydrualic Engineering. 110.12: 1751-1771. Kashefpur, M and Bakhtiari, M. 2009. Hydraulic jump in a gradually expanding channel with different divergence angles, 33rd IAHR Congress. Advances in the Fundamentals of Water Science and Engineering, Vancouver. Koch, A and Carstanjen, M. 1926. Von der Bewegung des Wassers und den dabei auftretenden Kraften, Hydrodynamin. Springer-Verlag, Berlin. Lindquist, E. 1927. Anordninger for effek tiv energiomvandling vid foten av over fallsdammar. Sartryck ur Skrifter utg ivna med anledning av Kungl. Tekniska Hogskolans. 100 - Ars Jubileum: Stockholm. Movahedan, B and Dadmehr, R. 2009. Effects of abrupt and gradual expansion of rectanglar section on hydraulic jump charateristics, Iranian journal of Irrigation and Drainage, 3.1:101-112. Najandali, A., Esmaeili, K., Farhoudi, J and Ravar, Z. 2011. Effect of triangular blocks on the characteristics of hydraulic jump, Iranian Journal of irrigation and drainage. 2.5: 234-241. Rajaratnam, N. 1976. Turbulent jets. Elsevier Science, Amsterdam. The Netherlands. Safranez, K. 1927. Wechselsprung und die Energi evernichtung des Wassers. Bauingenieur 8.49: 898-905. Valiani, A. and Caleffi, V. 2011. Linear and angular momentum conservation in hydraulic jump in diverging channels. Journal of Hydraulic Research. 51.5: 601-607. Vischer, D.L and Hager, W.H. 1995. Energy Dissapaters, Hydraulic structure design manual IAHR.206.